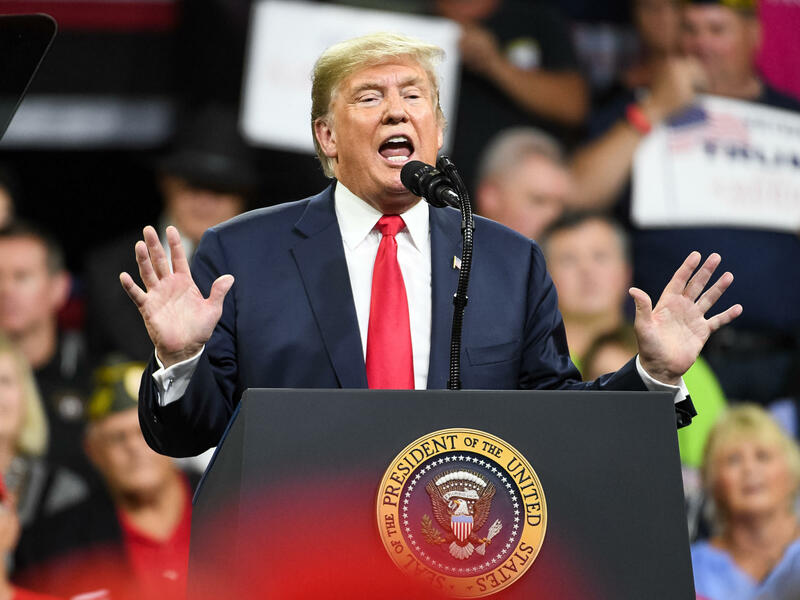 President Trump speaks at a campaign rally in Tennessee in support of Republican Senate candidate Marsha Blackburn. In one infamous case in 1989, Trump actually took the opposite approach. That year, a woman jogging in New York's Central Park was brutally beaten and raped. Five black and Latino teenagers, known as the Central Park Five, were charged with the crime. Before they were brought to trial, Trump took out full-page ads calling for the reinstatement of the death penalty in the state. The ads called for the city government to "unshackle" law enforcement officers from concerns about "police brutality." "The problem with our society is the victim has absolutely no rights and the criminal has unbelievable rights — unbelievable rights," Trump told Larry King in a CNN interview in 1989 discussing the ads. Years later, the five men were exonerated by DNA evidence, and another man confessed to the crime. The five reached a settlement with the city in 2014 for $41 million. Trump decried the settlement in an op-ed in the New York Daily News, saying it was a "disgrace" and that the wrongfully convicted men were not "angels" in the past. Yusef Salaam, one of the Central Park Five, told MSNBC in 2016 that Trump owed them an apology, but he didn't expect to get it. "This thing that he did to us, calling for the reinstatement of the death penalty, I always think if this had been the 1950s, we would have become modern-day Emmett Tills," Salaam said, referring to the 14-year-old African-American boy lynched in Mississippi in 1955. Trump has continued his selective support for due process as president. Even with the 2016 election long over, he still presides over campaign rallies where crowds chant "lock her up," referring to his onetime rival Hillary Clinton. "It's deeply troubling to read the president's pattern of comments about people presuming their guilt, particularly people that are under investigation by his government," said Jonathan Turley, a law professor at George Washington University. Trump has targeted numerous current and former government officials, from former FBI Director James Comey to Justice Department employee Bruce Ohr, accusing them of breaking the law. The president has repeatedly said special counsel Robert Mueller should be investigating Democrats and those he seems to consider opponents. "If he was doing an honest report, he'd write it on the other side," Trump told reporters in August. "Because when you look at criminality, and you look at problems, take a look at what they did, including colluding with the Russians — the other side." Even as the head of the executive branch, Trump still seems to behave as if he is outside of law enforcement, Turley said. "That's a very flawed concept, because he's not just anyone. He is the president, these FBI agents ultimately report to the director of the FBI, who ultimately reports to him," he added. Although Trump has invoked due process when it comes to Kavanaugh, the Senate confirmation of a Supreme Court nominee is not the same as a court case. "There is no legal due process, it is an entirely political proceeding," said Clark Neily, vice president for criminal justice at the Cato Institute. Neily said that does not mean the Senate should not strive for a "moral fairness" to maintain institutional credibility. Asked by NPR about Trump's support for due process in light of his history with the Central Park Five and "lock her up" chants, White House press secretary Sarah Sanders defended the president. "He is simply stating the fact that we are a country of law and order, we are a country that still believes that you're innocent until proven guilty and we want to see that process go through in its entirety," Sanders said. But, Neily argued, Trump has applied those principles unevenly, depending on who is accused. "He occupies the bully pulpit and he is in a position to remind Americans that we are a rule-of-law nation ... he's consistently failed to do that unless it's in the service of people or objectives he personally cares about," he said.